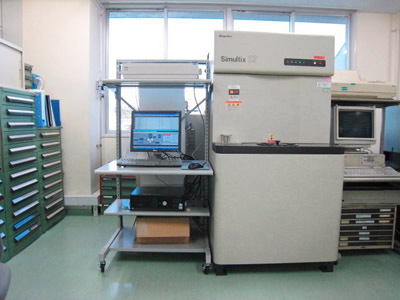 [Fluorescent X-ray analyzer] Daido Bunseki Research Inc. Principle By irradiating the analysis sample with X-ray, core electrons within atoms are emitted out of their core. Secondary (fluorescent) X-ray generated when outer electrons fall into the core is dispersed to each element-unique wavelength, and the X-ray intensity is measured electrically. Along with emission analysis, this is the primary means of iron and steel analysis.